Side Trip to Kathmandu ($12.95, 186 pages, ISBN: 978-1-60381-297-9), is the third installment in a cozy mystery series by Marie Moore featuring Sidney Marsh, a New York-based travel agent. In this adventure Sidney and Jay are recruited by their glamorous friend and sometime client Brooke for a luxury tour of India and Nepal in an effort to discover which of their fellow travelers is a murderer. “Author Marie Moore is a retired tour agent and guide. Her Sidney Marsh murder mysteries are (in Agatha Christie fashion) enchanting tales with strange clues that leave readers in the dark until the end. 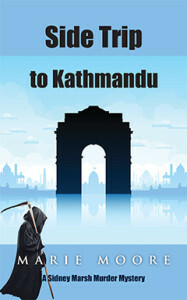 Side Trip to Kathmandu is a fast moving tale with intriguing characters and unexpected plot twists.” Read more…. “I really enjoyed this book. Reading about the exotic locations and meeting the people Sidney and Jay tour around with is just fabulous! Always mystery and intrigue that happens in a Sidney Marsh book. Can’t wait to see what Sidney and Jay are up to next.” Read more…. Sidney Marsh’s job as a New York travel agent is on the line. On her last two tours, she and her colleague Jay ended up smack in the middle of murder and mayhem. Their sleuthing sideline did not endear them to their employer, Itchy Feet Travel, so naturally they are relieved when their wealthy friend Brooke requests their presence on a no expense spared tour of India and Nepal. Another agency has made the arrangements, so all they need do is sit back and enjoy the ride. Well, not quite all. Brooke has enlisted them to keep a sharp eye on their fellow travelers, all “friends” who have grown rich from the demise of others. After surviving an attempt on her life, Brooke is certain the culprit must be one of the five: a handsome Scotsman, a Bollywood actress, an investment banker, a Parisian filmmaker, or a twice widowed blonde. Many of the tour accommodations prove to be as dodgy as the reputations of the travelers themselves. After one of the members of the moving house party dies of an apparent heart attack, everyone’s nerves are on edge. Sidney can hardly be blamed for assuming a deadly game is afoot … or for falling for Adam, the doting Scotsman. Now, if only she can unmask the killer before the killer beats her to the punch. Marie Moore is a native Mississippian. She graduated from Ole Miss, married a lawyer in her hometown, taught junior high science, raised a family, and worked for a small weekly newspaper—first as a writer and later as Managing Editor. She wrote hard news, features and a weekly column, and won a couple of MS Press Association awards for her stories. In 1985, Marie left the newspaper to open a retail travel agency, which she managed for the next fifteen years. The Sidney Marsh mysteries are inspired by those experiences. Marie is a member of Sisters in Crime and Mystery Writers of America. She and her husband live in Memphis, TN, and Holly Springs, MS. For find more information, click here. I looked up from my trance to find Adam MacLeod’s green eyes smiling down at me. The others apparently had gone on ahead. I could see the group following Rahim, snapping pictures, strolling alongside the marble reflecting pool toward the great dome. With a wry laugh at my idiotic yammering, he took my arm to prevent me from bolting down the path. I didn’t know why this attractive man made me so nervous. I just knew that he did. Hearing his words, I did slow down, taking a deep breath and resolving not to act like a fool. I looked up at him as we walked together but he was not watching me. He seemed lost in his own thoughts. His handsome face looked sad, and in the sunlight, for the first time, I noticed glints of silver in his dark hair. I didn’t comment, watching him carefully as we walked. I was thinking of the sudden death of his own wife, and I knew that he must be thinking of her as well. The lines in his tanned face deepened as he clenched his jaw. Had he loved her as this ancient king had loved his queen? Did he love her still? Brooke had said she’d heard mention of other women in Adam’s life since the wife’s accident, but none appeared to be lasting or serious. Then his dark mood seemed to pass. He pointed to a grassy lawn on our left where a white ox pulled a mowing machine, guided by a turbaned workman. “I’ll wager you’ll not have mowers like that in New York,” he laughed. I smiled, standing beside him as we watched the odd, old-fashioned contraption clip the bright green grass. “Nothing here is like New York,” I said.